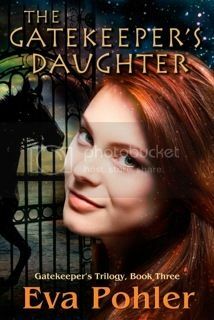 In this final book in the trilogy, The Gatekeeper's Daughter, Therese may have finally succeeded in becoming a goddess, but if she wants to remain one, she'll not only have to discover her unique purpose, but also make some allies among the gods. Artemis sends her on a seemingly impossible quest across the world, while Than searches for a way to appease Ares. To make matters worse, her baby sister's life depends on the outcome of her quest. As always, Pohler manages to remain mythologically accurate while telling a completely unique and one of a kind tale. This novel picks up right where the previous story in the trilogy left off. Pohler weaves an intriguing and captivataing tale that tells a love story and a tale of self-worth on many different levels. As an amazing storyteller Pohler draws you in with her immaculately put together storyline. She keeps you there with her brilliant descriptions and narrative that are so clear and inviting that they allow you to walk this world with the characters. Although we got to know many of these characters in the previous novels, their true selves become even more apparent in this novel. Pohler continues to develop the main characters as they continue to grow as individuals and as a couple. She also gives us further insight into the hearts and minds of the supporting characters, allowing her readers to see why and how the conflicts in this novel and the series as a whole, came to pass. Overall, her character development is unique in that the characters, regardless of their age, learn and admit things about themselves as we learn them. Self-growth and realisation is a never-ending process in this story. This novel was a great ending for the Gatekeeper’s Trilogy, even though I still want more time with these amazing characters who have wormed their way into my heart.